I’ve always been a fighter. An environmental activist, fundraiser and psychic. As a Master 11 Lifepath (Spiritual Messenger) I have a burning desire to leave this world more conscious than I found it. Read more on Master 11’s. It’s been quite a ride. As a baby, I was born with jaundice and developed whole body eczema (see this post on the spiritual meaning of eczema) My father thought I’d never find a husband because of my crocodile skin. Then a nurse told my parents to take me off cow’s milk and voila, I was cute again. I came from a beautiful, complex family. Chinese families want a son first, not a daughter. Talk about inner conflict. It was a painful beginning, softened by the arrival of my younger sister who is my beret-wearing, artistic twin. I thank Family Constellations therapy for helping me to heal these early issues. As a child, I once stood in front of a wall, fuming as a group of older boys threw tennis balls – as hard as they could – at me. Why? Because I had challenged their right to play there. There was an unspoken rule that they owned the playground and I disagreed. No one sided with me, but I grew inside wings that day. I realised that no one can take your confidence away – see this post on beating bullying. For years, I hid in the library or toilets at lunch to avoid being teased – for my flat face, yellow skin, inarticulateness, acne, tallness, thinness, braces, anxiety – even my socks. I’d spend 10 minutes each afternoon waiting to cross the road because I was so afraid of cars. Kids used to stand and laugh at my jitters. At eight, I read over 150 books (the entire children’s section) to escape my sheer frustration at life. I duxed my class that year and was moved to a school for the gifted and talented. Finally – a chance to be understood. At 12 I was attending the top high school in NSW, James Ruse (which produces Rhodes Scholars and the occasional Booker Prize winner). Now the race was on to become a doctor and make my family proud. Only I couldn’t go through with it. At 16, I cried in front of a teacher so he’d boost my exam mark by 0.25%. It lifted me 8 places on my report card. I was terrified of failing, because there was a waiting list for every position in my grade. That’s how competitive things were. A voice in my head said “This is not what life is about.” In the end, I missed out on medicine after flunking the second interview. The maverick in me prevailed. When asked about hobbies I talked about juggling and saw the interviewer’s expression. (Having met Patch Adams, the clown doctor, I’m sure I would have left medicine anyway. Incidentally, I now live in a house owned by a circus crew). So, at 18 I tried to save the planet. I went into Environmental Science – science with a deadline, as the lecturer said. After completing my Honours at CSIRO, I waded into Government. I competed against 800 graduates for one of a dozen placements in Canberra and won – possibly for the joke I made about 2001: A Space Odyssey to a sci-fi loving interviewer. In my 20’s, I was barracking for a sustainable future. I worked at the United Nations in Bangkok on turtle conservation. I trained in Kakadu with the rangers and traditional owners. I moved to Brisbane to help clean up its beaches. At 23, I was engaged, ready to be married and could have had children, but it wasn’t the right time. I was still looking for my life purpose. Read more on lifepaths. I felt that something was off. My relatives still drank turtle soup. I’d seen the effects of alcoholism in Indigenous communities. And people cursed me when I asked them not to drop their cigarette butts. I had no traction. So, at 26, I tried to save the hungry hordes. I worked in charity, co-raising millions of dollars for people and animals in need. I talked about sick children, and whales being harpooned. Eventually, I burned out. I got tired. I never felt enough. When I was 28, my Dad got cancer. Fortunately, he survived. Still, I freaked out. I realised I was chasing immortality in all the wrong places. The cycle had to stop. After all, winning starts with choosing the right battle. So I gave up trying to fix others, and overhauled myself. I studied Holistic Counselling, The Work of Byron Katie, channelling and nutrition. I devoured self-help books, palmistry and numerology texts, anything that could refill my heart. And during that process I discovered a simple truth – that, people listen to those who listen to themselves. 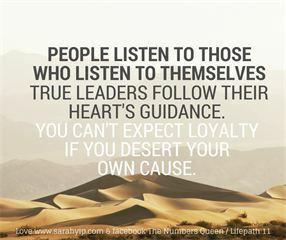 True leaders follow their heart’s guidance. You can’t expect loyalty if you desert your own cause. That’s why, at the ripe old age of 30, I listened to my inner voice and took off. I left behind a career, house, relationship and many dreams to become a professional palmreader. People thought I was crazy. I thought I was crazy – and I had to find out if that was my essence. I was exhausted trying to think my way through life. I wanted to feel at home in my body, with all its quirks and sensitivities. You see, I come from a family where people have been given anti-depressants and electro-shock therapy for mental illness. Some of them died from it. I had to know if I carried this time bomb too. I sure as hell wasn’t going to settle down before I discovered the truth. So, four years later here’s the good news – I’ve discovered I’m not crazy. There is a Divine order to life. We have Souls. Angels exist. You are Love. 11:11 is an awakening code. And most of all – the Universe wants you to succeed. How did I prove to myself that there is a force for Good or G.O.D (Good Orderly Direction, as author Julia Cameron says)? She’s a 29/11 Lifepath in numerology, like me. Well – that’s a whole other blog post – read it here (link coming). I also write on co-creating miracles and manifesting love. 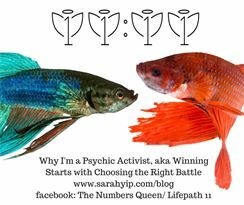 You could say I’ve become a psychic activist – I fight for your right to hear your Higher Self. Heeding your intuition gives you strength. It stops the endless cycle of self-criticism. You are here to thrive! What a fantastically honest and open blog. I am so honoured to call you my friend Sarah. The spiritual messenger life path certainly is the hardest one… I felt like I was swimming upstream for the first 38 years of my life. Thank you so much Divine Jill!! You are an Angel in human form! Much love to you my fellow 11 lifepath’er.